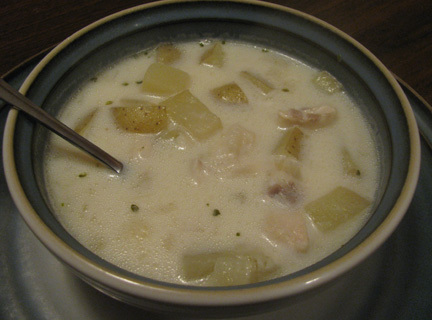 Pack a lot of taste into a bowl of Fish Chowder without spending all day at the stove! Cook the onions and bacon in a bit of butter in a Dutch oven. Do not brown the onions. Add the thyme, bay leaf and salt and pepper. Add water and bring to a boil. Remove from the heat and place the fish in the water. Cover and let stand for 5 minutes. Remove the fish and set aside. Strain out the bacon and discard. Return the pot to a simmer and add the potatoes, cooking until they are fully cooked and even are beginning to break apart. Mash them in the pot a bit. Whisk the cornstarch into the milk and add to the pot, returning to a simmer. Add the fish, broken up into bite-sized pieces. Let the pot stand on low heat for a few minutes. Serve immediately.